Sometimes our loved ones are struggling and we want so badly to be able to support them in anyway we can, but don’t know the best way to do that. And sometimes when we don’t know the best way to support we just don’t offer. Its not that we don’t love the person or care about what they are going through, we just don’t know the right things to say, it feels uncomfortable and the last thing we want to do is make things worse. Well fear no more! 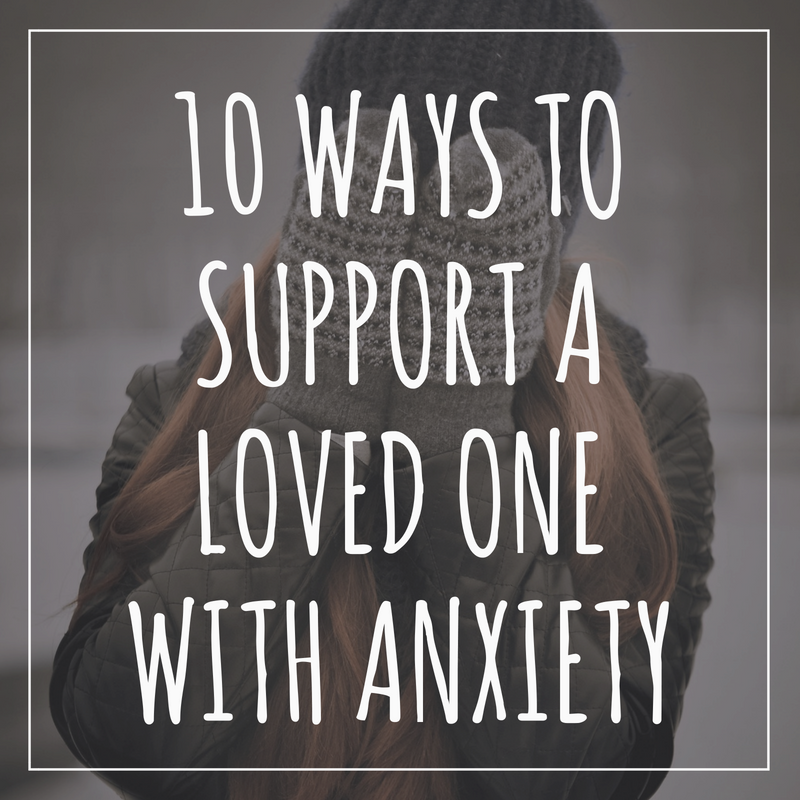 I have compiled a list of ways you can offer support to those in your life who may be struggling with anxiety. We all want to feel supported and know we have someone to turn to in times of need. Checking in can help remind them that you are there and that you care. 3.) Ask if there is a specific action you can take to help them in their current struggle with ______________. Sometimes there is something specific you can do based on the anxiety they are having. For example, maybe they want to meet new friends but don’t want to go to an event alone. Or maybe they have a public speaking event and it would lower their anxiety to practice in front of someone first. 4.) Do research about anxiety to better understand what they are going through. Maybe a friend said they were going to be somewhere and last minute canceled. This can be frustrating but they may have not come because their anxiety was too intense or they had a panic attack. Understanding can make it easier to be empathetic. Sometimes anxiety can feel overwhelming and isolating. Listen and let them know you hear them and understand. We so badly want our loved ones to feel better and to feel better now. But there is no quick and easy fix to anxiety. Anxiety is a journey. It will take time. 7.) Stay calm to help them be calm. When we were young and were upset we would often go to our parents and they would calmly listen and help us through our struggle. We “co-regulated” off of them. We were able to calm ourselves because they were calm. We do this as adults too when we call a friend in a time of need looking for reassurance. 8.) Assure them the are going to be alright. Anxiety tells the lie that “it is not going to be ok”. Let your loved one know that everything will be alright. Even if they do not see the light at the end of the tunnel, you do. 9.) Take care of yourself. The first step to supporting others is supporting yourself. You can’t pour from an empty cup. Self-care is important. 10.) Encourage them to get help. There are professionals who are trained specifically to help individuals manage anxiety. Encourage them to reach out to a counselor who specializes in anxiety who can help equip them with tools to manage their anxiety further. Theresa Leskowat MS LPC is the Founder and Owner of Clear Vista Counseling located in the Dilworth area of Charlotte, NC. Theresa specializes as an Anxiety Therapist and Divorce Counselor.